You are here: Home / Countryside & Environment / Saving Malta’s trees. A scorched-earth policy laid bare. Saving Malta’s trees. A scorched-earth policy laid bare. Planting street trees in Malta is as alien as a water tap in the middle of a desert is to a Bedouin. Trees and nature or their understanding is light years away from the Maltese mentality. One of the common sights in Malta is the pristine condition of homes, in particular the area immediately in front of the doorstep. The nation’s industrious housekeepers wash down the dust, sweeping it onto the neighbour’s side, and so it moves on, to be swept down to the next, and so on till it reaches the end of the street. Everything is polished to a shine, nothing out of place. This mentality is reflected in how we treat nature. We want our nature to be orderly. To achive this many country lanes clad with wild flowers – the nesting and breeding ground for various insects, some common, some endemic, others rare – are regularly treated to herbicides, pesticides, or mechanical cutters to remove what many Maltese refer to as Haxix Hazin, (bad grass), the rest of the world refers to as wild flowers and biologists refer to as biodiversity. In 2005, this mania for the orderliness of nature reached a peak when the then Ministry for the Environment and Rural Affairs, today’s Ministry for Resourses and Rural Affairs (MRRA), let loose and defended the Environmental Landscape Consortuim’s (ELC) handling of Buskett, a 500-year-old woodland and tree conservation area, where ALL trees are protected. As this precious and unique old woodland looked “messy” as only nature can look “messy”, the Environmental, (funny that), Landscape Consortuim (ELC), experts at desiging pretty roundabouts, were let loose with the result that protected trees were cut down, uprooted or heavily pruned. Important, crucial, nesting, breeding and feeding areas for insects and birds like undergrowth were also removed. If God, sometime-back-when in the garden of Eden, believed, that the Maltese Islanders were about to let nature be nature, he grossly underestimated our superiority complex in knowing better. While our biodiversity is rich in trees most, if not all, according to MEPA are under threat, rare in the wild and can only be found in private gardens. 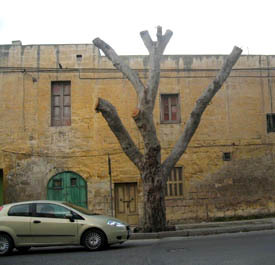 It will come as a shock to many non Maltese to know that while in other European countries there are policies that safeguard trees in urban areas, here in Malta, it has been deemed convenient to remove the protection of all urban trees which were protected in a law in 2001 only to have these safeguards removed in 2011, so that now, individuals and government Ministries can cut down, remove, uproot, replant or butcher trees irrespective of age or protection level, without having to apply for a Malta Environment & Planning Authority (MEPA) permit. In recent times, before the Trees and Woodlands (Protection) Regulations, 2001, which protected all trees, tree-lined streets were threatened with cutting down and uprooting. One such notorious case was the main road going through Fgura which lost a few hundred trees, for various reasons root damage to people’s houses, complaints of distrubed views (usually scenic vistas of across the road), tree leaves dirtying, and of course, bird droppings. Zebbug before and After. Nice green roundabout though. The ammended Trees and Woodlands Protection Regulations, 2011, saw most protection of trees in urban areas removed, regardless of age or species. In fact, this law allowed massive projects to go through with trees being removed for the greater good of “embellishment” or “upgrating” projects. Bormla and more notoriously Zebbug are among the more recent. The main entrance to Zebbug was a tree-lined avenue where some 200 trees were removed turning this once beautiful street into an desert. Apart from the direct benefits that have been lost to the people that live in these streets, sound insulation, thermal protection of the houses from heat, cold and wind with the resultant lower energy bills, clean air, a shaded environment in which to walk and socialise, higher protection of users from potential traffic accidents, lower speeds and many other benefits. There is an indirect cost to the removal of these street trees. To get this tree uprooting into perspective we are talking of a few hundred street trees that have suddenly, in some instances, capriciously been removed and not replaced. If one looks at every tree, its soil and the location were it had been growing, as a microcosom of nature, habitats for pollinators like bees, and others, spiders, moths, butterflies, a variety of other insects, then in fact, we have not only uprooted trees we have actually destroyed a good part of our urban biodiversity, at a time when we find out that we not only keep on adding new creatures to our heritage, but that we do not have a data base for our biodiversity. The removal of trees due to property damage is understandable. What is not acceptable is that all the trees are removed, and that in the case of those trees that are doing damage, remedial provisions have not been looked into – such as ways like root pruning – to both stop the damage as well as save the trees. Unfortunately, the attitude here is to uproot and remove. Another unforgivable attitude rears its head when trees are removed and there is no obligation to replant trees in the same location. There also appears to be a abysimal ignorance on how to manage trees. Let’s take pruning as an example. Material researched from federal, international and national tree mangement guidelines in countries as far afield and diverse as the USA and Australia or near Europe, stipulate that pruning less is best and that no more than 25% to 30% of the crown should be pruned. In Malta, it is the accepted practice that less that 25% of the crown should be left on the trees. The tree pruning that has been demonstrated by ELC and other contractors that are contracted by government or local councils, is not pruning but butchering and has often led to unsubstantiated accusations that this butchering of trees is being done to create wood to sell as firewood or as mulch for the many landscaping projects that go on around the islands. I stand to be corrected, but to four years ago there was only one qualified arborist on the island and judging from the disasters that we have witnessed pruning does not appear to be done under his guidance. This link will teach you some basic fundamentals on how when and why to prune a tree. As you go over you will realise the lack of knowledge that our “professionals” have. Pamela Hansen, a noted and well respected local journalist, having had enough of this disrespect towards our arborial heritage, decided to set up a very successful FaceBook group called SAVE THE TREES. While the overwhelming majority of the posts are firmly and categorically against the tree mangement policies, “professionals” in the field hotly defend the butchering of trees and argue against the planting of trees on streets, because of the damage that these do or can do to infrastructure and property. It is quite obvious that there is the possibilty that tree roots can cause some damage, but only when trees are incorrectly planted. Planting street trees that copy the tree-lined canopies we so admire when we go on holiday is a sience that is yet to reach Malta. Potential root damage can be mitigated by ensuring a proper planting bed, using root inhibitors that guide the roots away from potential problem areas, ensure that bed is not compacted and other actions to ensure a healthy street freindly tree. One of the problems that we seem to face in Malta is that street designing is normally done by architects and or engeneers, to whom understandably, landscaping and qualitiy of life are secondary to the engeneering concerns and challenges they face. An underrated profession in Malta which can greatly contribute to the quality of our streetscape is the Landscape Architect. Landscape architects aim at creating living streets that are beneficial to people in a physical and psychological way. Unlike “designers” contracted by ministries, whose idea of “greening an environment” is to plant an olive grove or a tree in a tub, a landscape architect takes a holistic approach so that streets and public open spaces are integrated within the urban context making the streetscape more welcoming and user-friendly . Surely a landscape architect would not consider planting an olive grove which does little to stimulate the senses as was done recently in San Gwann, or design a public open space with priority given to cars and not pedestrians as is being carried out in ta’ Xbiex. I recently had the pleasure of sitting down for an exchange of ideas with Antoine Gatt, a Landscape Architect, who showed the many possibilities that can be created to make our villages not only greener but safer and more attractive unlike the status quo where streets are barren, produce glare and trap heat. While there are positive attempts in tree planting and relocating uprooted tress these are usually done well away from our living habitats where these can do the most good. As it now stands we are in a situation that if we want to enjoy some clean air and the stress releiving green of trees, we need to get in our cars and face hours of tail to tail car cues to get to a crowded woodland, where we will struggle and get stressed out finding a parking place not to mention some peace and quiet. What would normally be a restful experience to get some green time with our families can turn into quite a stressful experience. We need to realise that trees are not simply ornamental things we plant for photo ops, we need to understand that trees are our right to a healthy life and if needs be we need to be more affirmative with politians and stop applauding them for the few trees they plan in a tub or grove while leaving the rest of out towns and villages arid, stressful, barren heat traps. As Antoine Gatt says on his website: “We believe that everyone has the right to a beautiful, healthy and inspiring landscape for living, playing and working. We believe that sustainability is the way forward and as landscape architects we have a role to play in alleviating the impacts of global warming”. Mike, thanks for posting the comment. The problem that we face here is that there is NO, and I mean absolutely, no awareness at local and national government regarding the benefit of trees to the communities. I will illustrate two examples not mentioned in the above article. Another example is the new roads that they are building from scratch with EU funding. Here was another perfect opportunity to create tree lined roads and avenues with the simple cost effective expedient of creating tree planting trenches. So now, in a country where trekking and walking are being promoted to tourist and Maltese, we are forced to face heat reflective concrete with pretty roundabouts and junctions planted with non indigenous plants. Does no-one like shade in Malta? It should be compulsory to plant trees as part of every development. With any luck there just might be some shade by the time anyone moves into it! You could do with demolishing some of the newer stuff and planting trees instead! Has Malta learned nothing from the Spanish Costa’s mistakes? Excellent balanced article. Nicely put and SO important to be said. 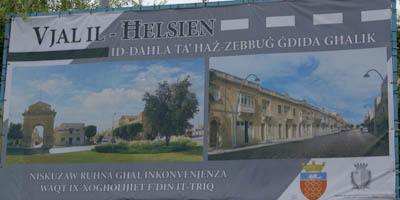 Begs the question, what does ‘make Malta Malta?’ Certainly not a tree-lined urban scape, nor landscape. Those uninhabited apartments perhaps? A very good article – Thank you for bringing it to a wider audience. A barren wasteland indeed, but at least the view of so many uninhabited apartments is now uninterrupted. Why would any foreign tourist want to go to Malta to see any of that? At least Flanders Fields were covered in poppies….. …………..
And why is Malta so set on destroying all that which makes Malta Malta? Thanks Martin, Antonio will appreciate this. It’s a long post but no way was I going to slim it down as it all needs to be said, and more. It’s a desert out there now it’s July, wind and dust galore. Why is the tree so vilified in Malta? Tubs of twigs just don’t stand a chance in our heat, even with irrigation. A wonderful post. I truly hope things can change. It breaks my heart to see the ongoing war against greenery in Malta.